Just as the new year began, like everyone we prayed for a peaceful, trouble free and happy year. Well, happy we are as positive things in ours lives make us happy. However, the year hasn’t really begun too well for hubby and me. From the time we left India, we’re facing problems one after the other. First obstacle – I go to my bank in Mumbai to get one of my debit cards activated. Tried it out at an ATM and it worked. Then the tech savvy in charge of cards informs us that our cards have a raised limit. He tinkers on the computer and tells us all is well. We are happy and leave the bank. Next day early morning at around 5 am hubby and I use our cards to pay for breakfast at the airport and they don’t work! Can you imagine if we had tried to purchase something with more value or required the cards to pay for some emergency? Still getting sorted out! Second obstacle – Flight delay for over 2 hours for a trip that usually takes only 45 minutes! Instead of getting home at 2.30 pm, we reach at 5.30 pm. Third Obstacle – We unpack, freshen up. Hubby is on the ipad and I was watching TV. Both kept on saying its time to go to bed, but we were glued to our seats for sometime. There was power fluctuations which is normal in this part of the world so we just ignored it. Suddenly, I see sparks coming out of a socket behind hubby’s massage armchair. Before we could even get up to switch it off, the socket behind the TV caught fire! It began to flare up so quickly. Luckily we put it off– hubby kept on beating it with a thick cloth. Now we have a fire extinguisher in the house. Need to look for the old blanket which might be somewhere in the cupboards. Whole night no power, its really humid and hot. So we decide to go to our beach apartment to spend the night. The water in the apartment taps does not come out in force,but we just go to sleep. In the morning when we get up, there’s water and sand everywhere in the corridors and stairways. We were told that a huge water tank on the roof top burst! Got home, had an electrician to sort out the problem which actually was a faulty trip switch at the main board downstairs. Scary! Fourth obstacle – Our househelp of so many years (over 18 years) decides that 6 weeks of holiday was not enough for him. He doesn’t turn up for work. When I called him to ask when he will come, I got the answer ” I’m sick, so don’t know when I’ll come!” Usually he will indicate when he’ll be back. Fifth Obstacle – Yes still not over, when I put the clothes in the washing machine, and none were soiled badly or had sand. The wash comes out with tiny pieces of some plastic bits much like synthetic leather and sand grit! Check all the pockets again, found nothing.Still a mystery where it came from. Still got the bits of black stuff at the bottom of the machine. Ran it on cleaning mode but it didn’t go away. Now to sort this out, need a vacuum cleaner! Enough of obstacles. In spite of all the obstacles I still managed to get my #74th theme on peas ready for #FoodieMonday #Bloghop. Blogging relieves stress for me. My moment of happiness.We were suppose to use only fresh peas for whatever we chose to prepare. 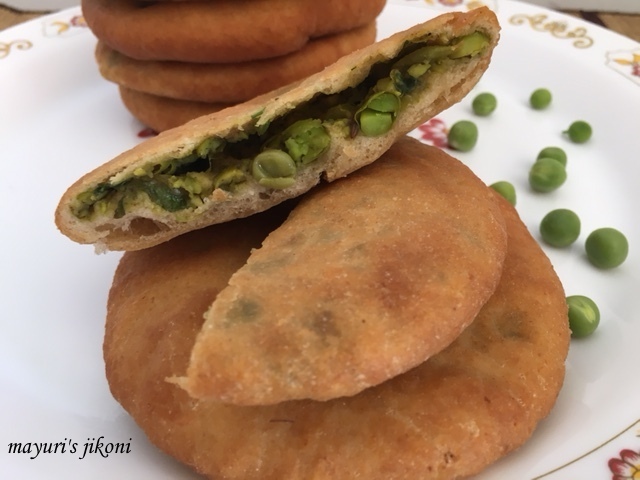 When a fellow member Kriti suggested peas I knew immediately that I would prepare a saved Tarla Dalal recipe – Khamiri Green Peas Puri. What’s so different about this puri from the normal pea puris you may ask? Well, khamir in Mughal language means yeast. The dough for this puri is prepared using yeast. The texture of the end product is a soft but slightly spongy puri. I made a few minor changes to the recipe but the end result was delicious. Ideal breakfast treat.Check out the recipe. Add ghee and rub into the flour. Sprinkle the yeast over the flour and mix. Form a dough using warm water.It should not be hard or too soft. Knead the dough for 5 minutes till its smooth. Shape the dough into a ball. Place it in the greased bowl. Cover the bowl with a cloth or cling film and let the dough rise for 1½ hours till its double the size. Mash the boiled peas lightly. Add cumin seeds. When they begin to sizzle, add the mashed green peas. Add salt, green chilli, ginger, sugar and mix well. Take the pan off the heat and let the mixture cool down a bit. Add cinnamon and clove powders, coriander and lemon juice. Knead the risen dough gently. Using a bit of flour, divide the dough into 8 equal parts. Roll each part into a ball. Divide the filling into 8 parts. Take one dough ball and using your fingers and thumb form a small basket or cup shape. Put one part of the filling in it. Pinch up the seams to close the cup with the filling. Flatten it a bit between your palms. Using a little bit of flour, roll it into a 4″ diameter circle. Repeat steps 3-7 with the remaining dough and filling. When its hot slide in one of the puris and fry it, turning it over often till its light golden brown in colour. Serve with a hot cup of coffee or masala tea. Use fresh peas to get a nice green filling. Warm up the leftover puris in the oven for 5-10 minutes. Fry the puri over medium heat and not high heat as you don’t want the dough from the inside to remain raw. Don't worry may be something good is in store ..I wish and pray that you have a wonderful year ahead ..The puris look super yummy ..Great to munch with some chai ..
Stay strong.I am sure something good is in store for you.Wishing you a great year ahead.Kachori looks delish.Thanks for sharing inspite of so many obstacles. Stay strong Mayuri. Have a blessed year ahead. Kachori looks delicious. What adventures Dee… I must say and you still managed to post such a lovely recipe. More than all this I am sure you are missing your daughter and this makes everything else worse. This phase will also pass away. Omg Mayuri dee!!! These khamiri peas puri are looking so tempting!!! Indeed the result must be delightful and happy!! !